Before you read our Top 10 Tips you really need to consider have 3 nights in Namche Bazaar. Having an additional nights acclimatization will give you the best chance at being successful, safer and having a more enjoyable experience in the Everest region. 1. Train Before you go. 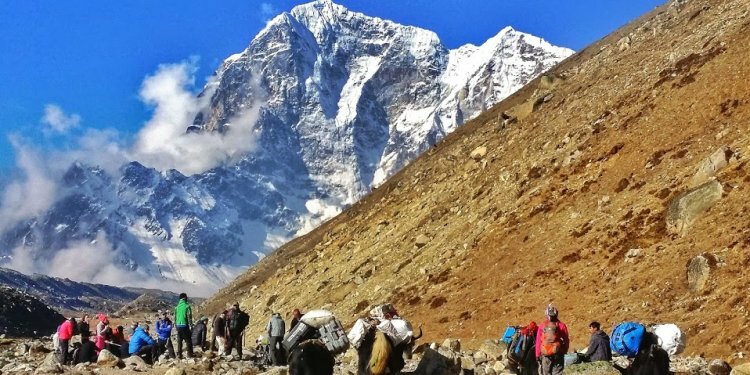 The trek to Everest Base Camp is a stunning walk through the world famous trail to Mount Everest. It is not a technical climb; you do not need to have any previous technical climbing experience or even any altitude experience to complete the trek. However, you do need to be physically fit and have excellent strength, conditioning and endurance to be able to complete the trek and to fully enjoy the journey. If you have not trained your body to withstand the pressures of constant strain at high altitude, you will find it a very difficult task to complete the trek, risking your and other people’s safety. I would recommend that you spend at least four days a week doing some sort of intense physical exercise for approximately three to four months prior to your starting date of your trek. Personally, I would have spent at least four days a week either walking up hill on a treadmill or walking on a stair-master for one hour to two hours building up to 10 kilos (22lbs) in a backpack on my back. I have always been lucky and lived in a place where I had access to hills to train on the weekends, and I found that this was the greatest training I could get for trekking. I would spend at least one day a week out in the hills or mountains for at least a 4 hour walk and up to 7 hours in a row. I cannot stress enough how important this was to my training. Having built the muscle strength needed in the hills, I had the muscle memory needed to complete the task of walking long distances day after day for 12 days continuously. If you do not have access to mountains or hills to train on, you can always add extra weight to your backpack and just do longer walks on the treadmill or in the gym. Contact us and we will help you prepare and train for this amazing adventure. 2. Mentally Prepare. Depending on your level of comfort with the outdoors, you may need to prepare yourself for life in the mountains. Luckily, I am a lover of the outdoors and very comfortable with the mountain life, including camping, bugs, dirt, baby wipe showers, and going to the toilet outdoors! However, for some who are more comfortable with the four seasons than a campsite, you may need to prepare yourself for what is to come. All accommodation on our trek to Everest Base Camp is in small tea houses, run by the local Sherpa people. You will have a bed to sleep in (albeit not the most comfortable bed in the world, but a bed to say the least), in a twin-shared room. There are options for showers lower down on the trail, if you decide to use them, however, many people keep clean by using baby wipes and a bowl of warm water each day. The toilet situations can be difficult at times, as in the tea houses they are generally not Western-style toilets, rather just a hole in the ground instead of a toilet bowl. You will also need to be prepared to use the great outdoors at times when you are on the trail with no tea house nearby. You do need to prepare yourself for these things, as you do not want to arrive on the mountain and have higher expectations and be disappointed. 3. Get the Right Gear. There are many parts of your gear that are essential for your trek into Everest Base Camp, and I am not going to go through every piece of gear you need for the trip. Click on the link and view our packing video. I am just going to highlight some of the specific pieces that I found to be essential. First of all, your feet are one of the most important parts of the body to take care of when trekking. Never skimp on footwear when you are going to be walking multiple hours a day, for twelve days in a row; your feet need to be comfortable and dry all the time. Buy a good, sturdy, waterproof pair of trekking boots and make sure that you break them in before you leave for Nepal. Number two, buy yourself a good down jacket with at least 650 fill down, but if you can afford it I would stick with a 700 or 750 fill down. Remember that every brand and style is different and if you are questioning your down coat, make sure to ask the advice of a professional before the trip as this piece of gear can be essential during the cold nights and mornings on the mountain. Usually the tea houses are quite cold higher up the trail and I found that I wore my down jacket every night during dinner. Number three, having both a platypus (ie, Camelbak brand) water carrier and a Nalgene style plastic bottle. Drinking water is essential in the mountains (See Tip #4) and I find that having a Camelbak helps you to drink more water as you do not have to stop to get the bottle out to drink, you can be sipping throughout the walk. I also carry a Nalgene style bottle on the trip so that I can have it filled with boiling water every night to help heat my sleeping bag. Another essential on Everest Base Camp, is having a sun hat. The sun can be extremely powerful in the Himalayas, and you want to have as much cover from the sun as possible. Now those few tips are obviously not the only gear you will need on the trip, but these are three essentials that I would make sure to have in your kit bag. Another good thing about traveling to Kathmandu before we leave for the trek is that you can purchase a TON of gear in the City. While I would not go to Nepal without the majority of your gear already packed and tested, however, if you need to pick up a few last minute things, you probably can find them in Kathmandu. We can help you with this. 6. Slow and Steady. When taking on a challenge like hiking to Everest Base Camp, or any long trek/climb, you have to remember that it is a marathon, not a sprint. Acclimatization to the low levels of oxygen in the mountains requires you to take your time, to slowly get your body used to lack of oxygen. All the research suggests, spending more time at 3, 500m/ 11, 500ft. So we spend 3 nights acclimatizing in Namche Bazaar. This is absolutely key to your success in the mountains. There is never a time on the trek where you should need to walk at a fast pace, you should only be walking at a pace that you can carry on a conversation with others, without feeling too much exertion physically. Obviously, there are tougher sections throughout the trek where you may need to stop talking and catch your breath, however you always want to try and keep your pace to a snail’s pace, not a rabbit’s! More acclimatization means a safer and more enjoyable trekking experience.